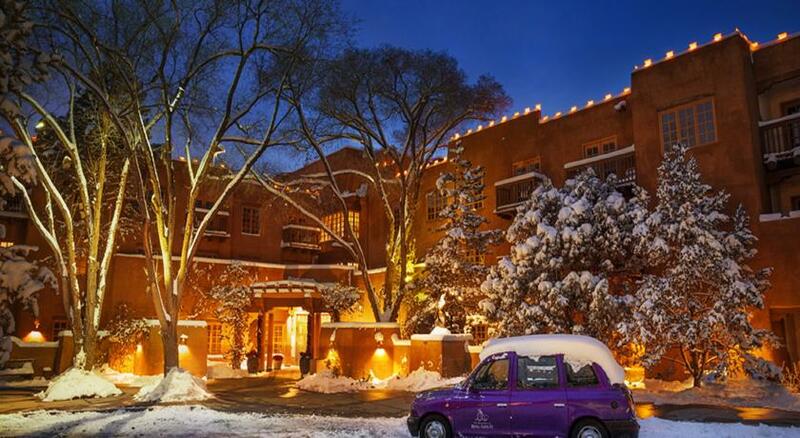 Top Solo Travel Destinations-Santa Fe for the Holidays: Pet friendly Santa Fe spa and free Wi-Fi! Fly to Albuquerque, New Mexico. Take a rental car or commuter van to nearby Santa Fe. Ski in nearby Taos for challenging slopes. Take a day trip to state and national parks. Sample numerous cafes and restaurants. Have a relaxing spa day. Shop the native handicrafts and silver jewelry. Tour historic cathedral and colonial buildings. Stay in the 4-star Hotel Santa Fe Hacienda and Spa. This 162 room special spa, Native American-owned hotel, is situated in Santa Fe’s Railyard District. Services include a relaxing spa on-site and fine dining options offering gourmet dishes. In addition to its comfortable accommodations, the Hacienda and Spa includes a cultural offering of oral history, ceremonial dance and handicrafts for purchase at the on-site gift shop. You can relax around an open fire, and enjoy Native American music. The on-site Amaya Restaurant offers you Native American-style dishes. Unique cocktails are also offered at the Amaya Bar. Guests can also enjoy a swim in the outdoor pool or a stroll outside through lush gardens. Within walking distance, there re other options for dinner plus museums and multiple art galleries. The heart of Santa Fe’s historic district is close by. Guest rooms include their own sitting areas plus a private fireplace. For added service, trained butlers are there to serve you. Guests will also enjoy both a free daily breakfast and afternoon receptions. For other options in Santa Fe and the Southwest USA, please go to our home page. Enter your dates in our booking engine. Choose from over 800,000 world wide lodgings from 5 star to economical home stays. Follow the link. Then be sure to use the filter on the left margin to get what works best for you and see the verified solo travel reviews.